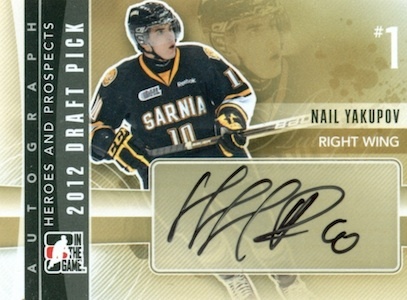 As the first overall pick in the 2012 NHL Draft, Nail Yakupov entered the league with high expectations from both fans and collectors. The Russian right winger did not disappoint and gave the Edmonton Oilers and card collectors strong hope for the future based on his rookie season. 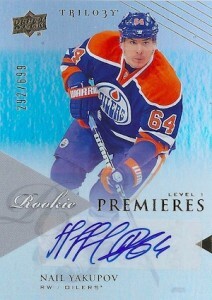 Because of this, Nail Yakupov rookie cards are seeing strong values and interest from collectors. Due to the 2012-13 NHL lockout, nearly half the season was lost, and this resulted in a rookie card delay for most 2012-13 rookie players. Although Nail Yakupov has several cards included in previous ITG products and Upper Deck redemption cards from 2012-13 hockey products, his official rookie cards are found in 2013-14 products. 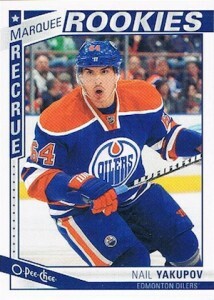 You can find all the current Nail Yakupov rookie cards listed below, including images. More will be added as new products are released. Please note, this is an ongoing list that will be added to as more 2013-14 hockey card sets are released and Nail Yakupov has more rookie cards. 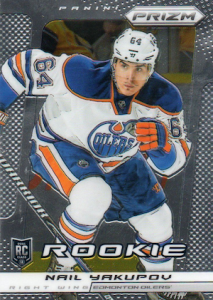 2013-14 O-Pee-Chee Hockey usually features some of the best-looking budget rookie cards, and the Nail Yakupov rookie card is no exception. The OPC Marquee Rookies fall 1:2 packs, so they are not completely common. There are also several tiers of parallels, including Rainbow Foil and Black Rainbow Foil (#/100). Additionally, Retro cards are more a variation card than true parallel, and the colorful design makes it immediately stand out. Prizm is still a newer product across the collecting landscape, but 2013-14 Panini Prizm gives hockey collectors their first full release of the Refractor-like cards. 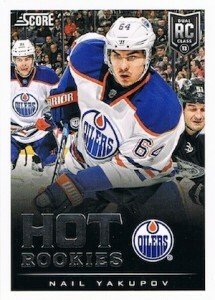 The base Nail Yakupov rookie card includes a textured silver border,large action image and small text box. Nine different parallels, including retail-only options, give player, team and set collectors an added chase. 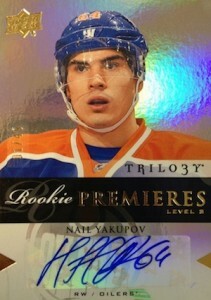 Collectors can also find an autographed Nail Yakupov card in Prizm. 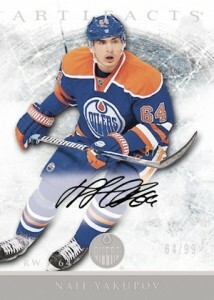 The general design an layout is very similar to the base card, but includes a different image of Yakupov and sticker autograph. Although the base autograph is not numbered, the card is a short print, which means the print run is limited to 200 or less. There is also a Prizm parallel numbered to 15. 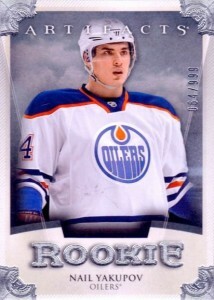 Another popular budget rookie option, 2013-14 Score Hockey uses a large HOT ROOKIES text box to help distinguish the rookie players and features an action shot of Yakupov. The darkened portion of the card does hurt the design a little, as over a third of the card is obscured by the shading. Several parallels add to the chase, including Alternate Back, Red Border, Gold Border, and Black Border versions. Although not considered a rookie card, there is also a Hot Rookies autographed version. 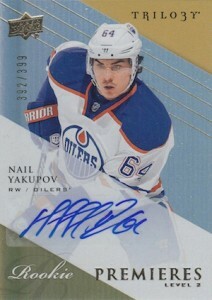 While it is not serial numbered, the Nail Yakupov autograph card was revealed to be an SSP. This means the print run is 100 or less. The Score base rookie cards and autographed versions both feature the dual rookie class logo. Featuring one of the most refined and ornate designs, 2013-14 Artifacts Hockey brings a level of class to hockey collecting. The base silver Nail Yakupov rookie card is numbered to 999 and is accompanied by Ruby (#/299), Emerald (#/99), Sapphire (#/85), and Spectrum (#/25) parallels. There are also several relic parallels that include various dual swatch combinations. 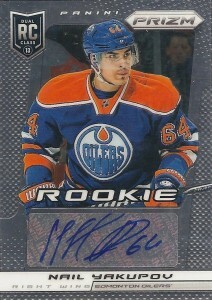 The first official Nail Yakupov base rookie autograph comes from 2013-14 Upper Deck Trilogy Hockey. The product features three levels of Rookie Premieres Autographs, with Level 1 numbered to 699, Level 2 numbered to 399, and Level 3 numbered to 49. 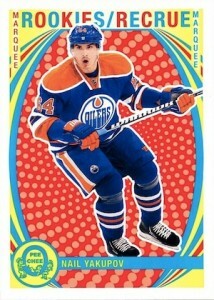 Each card features a different design and image of Nail Yakupov. While collectors will be disappointed by the sticker autographs and total print run of almost 1,500 cards, the appealing design and availability of Level 1 and 2 will make these cards a popular option. 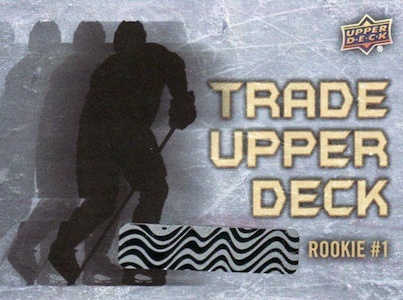 Upper Deck inserted redemption cards in 2012-13 Upper Deck Hockey and 2012-13 UD Artifacts Hockey. The redemptions themselves made no mention of specific players, but Upper Deck recently announced the complete checklist and that the live cards would be shipping soon. 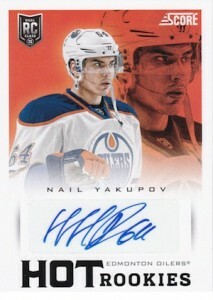 ITG put out their first card for Nail Yakupov in 2010-11 hockey products and have released several autographed cards since then. While not viewed the same as official autographed rookie cards for Yakupov, they still maintain decent interest, and represent a great way to get a cheap Yakupov autograph. Where can I nab a list of all Yak cards ever made to date.? NAIL YAKUPOV DIMINION RC AUTO PATCH #D 01 99 1 1 TRUE BASE RC AUTO FIRST MADE !